In collaboration with Lewisham Council, Volker Highways and BDP Architects, Benchmark developed contemporary outdoor seating for the revitalised Catford Broadway in South London. Catford Broadway and Catford Market play a significant role in terms of the local area’s economy. Just over £1.5 million of funding by the Mayor of London, plus an additional £600,000 from Lewisham Council was spent on a number of improvements designed to attract more people to Catford Broadway. 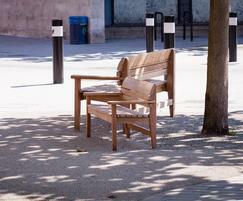 This included a complete refurbishment of the street, with new lighting and seating. Initially Benchmark was contacted by Volker Highways who were working on the regeneration scheme at Catford. 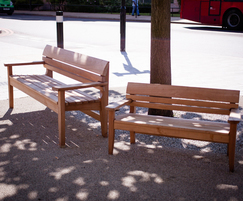 Bespoke benches for the scheme had been designed by BDP Architects, and Volker Highways were looking for a specialist timber manufacturer to implement the designs. 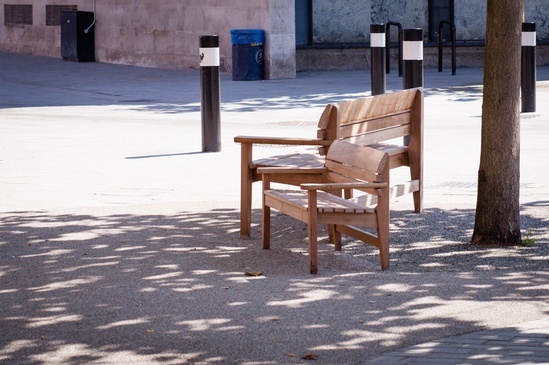 Following a site visit and discussions with the Project Manager at Volker, Benchmark, manufacturers of the Wales & Wales ranges of street furniture, offered to develop a hybrid of their standard Chico bench incorporating the design features of the BDP proposals. 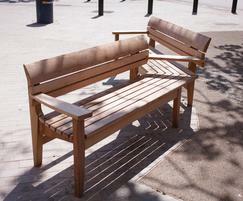 This included double aspect benches and angled benches, as well as a special small bench for children. 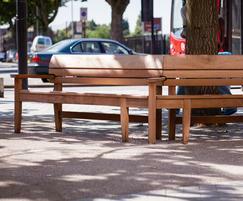 There was also a requirement for stainless steel and timber seat backs for new stone benches that were being installed. Given that lead times were challenging, using the Wales & Wales Chico designs as a starting point offered the distinct advantage of using tried and tested ergonomics and also a proven ground fixing system, both vital factors for any external public realm seating project. The Benchmark Studio took on the complex task of developing the designs over a 2 week period; the drawings were then approved by BDP. Construction began in early April 2014. 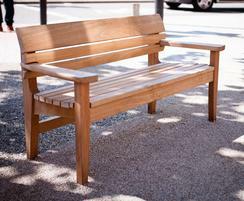 The benches were manufactured using FSC iroko hardwood by Benchmark’s craftsmen at their Kintbury workshop, and were delivered to site early in May 2014 meeting the project timetable.